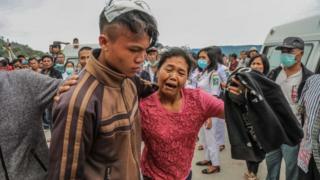 Indonesian police have detained the captain of a ferry that sank in Lake Toba in Sumatra leaving at least three people dead and more than 190 missing. The vessel went down on Monday in what is feared to be one of Indonesia's deadliest ship disasters. Only 17 people were rescued in addition to captain Tua Sagala. The boat was only licensed to transport 60 passengers and was operating without an official ticket system, making it difficult to trace those on board. Police say they have yet to question the captain, who is also reported to be the owner of the ferry, because he is traumatised. Lake Toba, the world's largest volcanic lake, was busy with tourists enjoying the Eid holiday when the ferry sank in poor weather. As many as 193 people, including children, are unaccounted for, police say. The authorities have relied on reports from survivors and the families of missing relatives. Many victims are thought to have been trapped inside t he vessel. On Wednesday, divers and an underwater drone joined the search efforts. The teams still need to locate the wooden ferry at the bottom of the 450m (1,500ft)-deep lake. "This is a test from God for our family," Fajar Alamsyah Putra, whose brother Bagas Prama Ananta is among the missing passengers, told BBC News Indonesian. "He was inside the ferry when the ship sank and could not get out, the ferry quickly capsized. A friend of his was on the deck and was able to jump off in time to get help from another passing ferry." I ndonesia's national search and rescue agency said the survivors had all been found within hours of the disaster and three bodies had been recovered. Desperate families have spent the past days waiting for news from the search-and-rescue boats returning to shore. According to official regulations, all boats in Indonesia must not exceed capacity and must have life jackets for every passenger on board. But the authorities admit that they struggle to monitor all the boats operating across Indonesia's vast archipelago. The national committee for transportation safety says that 40% of boat accidents in Indonesia are caused by human error and only 12% are due to bad weather. The European Union has gone ahead with retaliatory duties against $2.8bn worth of US-made products. Quiz: What causes a third of Europe's flight delays?